Silver Appleyard Ducks: We originally chose the Silver Appleyard ducks because they are critically endangered. We've now been enjoying them for a couple of years and have found so many reasons to keep them going on our farm. 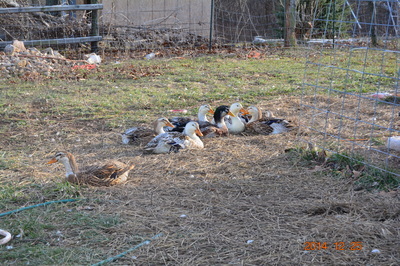 I'd like to share what the Livestock Conservancy says about them: "Applyards are being raised for exhibition, pets, decoration, eggs, and gourmet roasting ducks." (Holderread, 2001) They are one of the best layers among the heavyweight ducks, averaging 220 to 265 white shelled eggs per year. Appleyard meat is lean and flavorful. They are active foragers with calm temperaments and will tend to stay close to home if well fed." We have found this to be so thoroughly true! 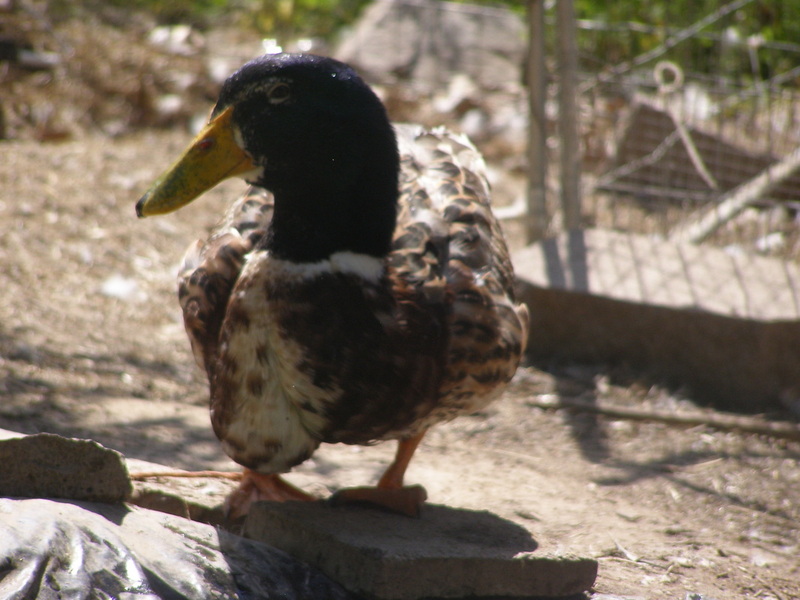 Also from the Livestock Conservancy: "This big, colorful duck was developed by Reginald Appleyard at his famous Priory Waterfowl Farm near Bury St. Edmund, England. 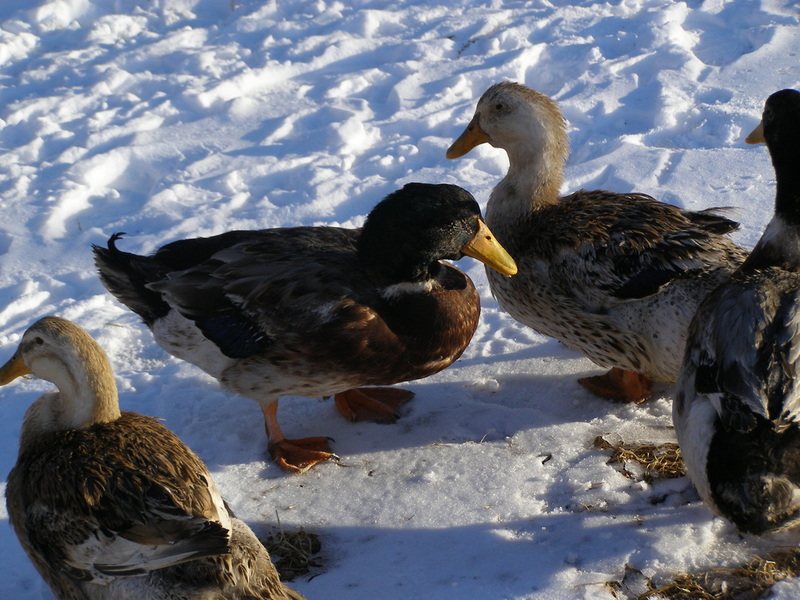 His goal, as stated in a 1940's farm brochure, was to make a beautiful breed of duck, with a combination of beauty, size, lots of big white eggs, and a deep long, wide, breast." (Holderread, 2001). Appleyards were brought to the United States in the 1960's and became available to the public in 1984. 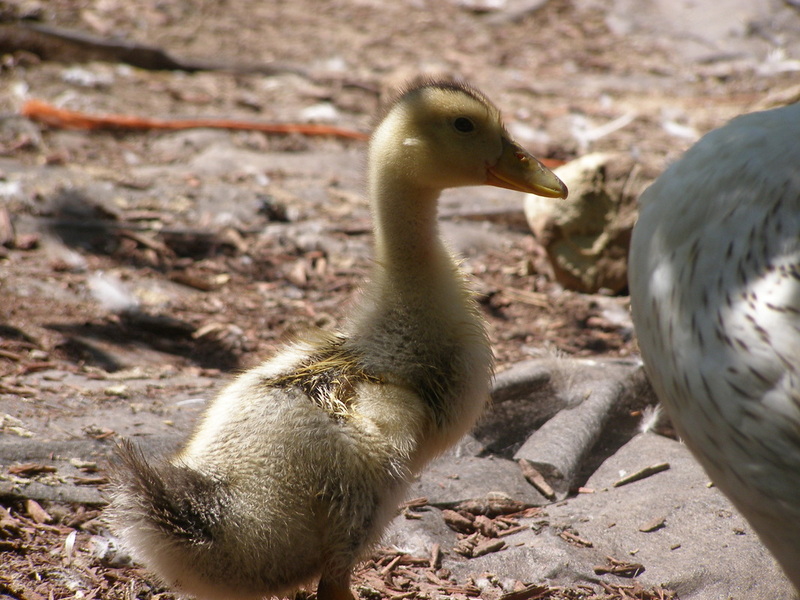 The American Poultry Association accepted the breed for inclusion to the American Standard of Perfection in 2000.The Silver Appleyard is a large, sturdily built duck that weighs between 8-9 pounds. This breed's carriage varies from 15 to 25 degrees above horizontal and its body has a "blocky" conformation. The drake's bill is greenish or yellow with a black tip, his eyes are brown and his head and neck are greenish-black, sometimes exhibiting striping with age. 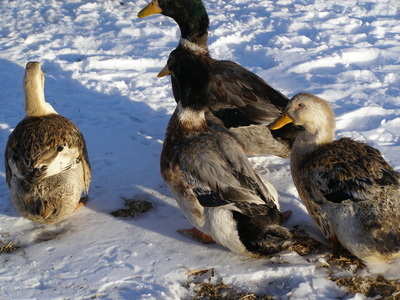 The breast, sides, shoulders, and flank on a drake are reddish-chestnut with white frosting and lacing, his underbody is creamy or silvery white and his wings are gray and white with bright blue cross-stripe. The tail is blackish bronze, and legs and feet are orange. 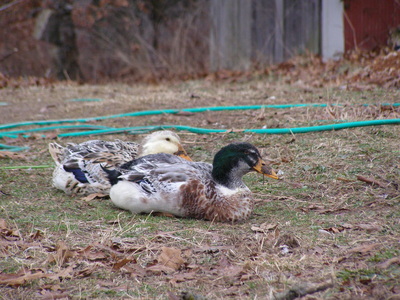 The female's bill is yellow or orange with a black bean, her eyes are brown and all plumage is generally whitish with gray, brown, fawn and buff markings with a blue cross-stripe on the wings. The legs and feet are orange with dark toenails." 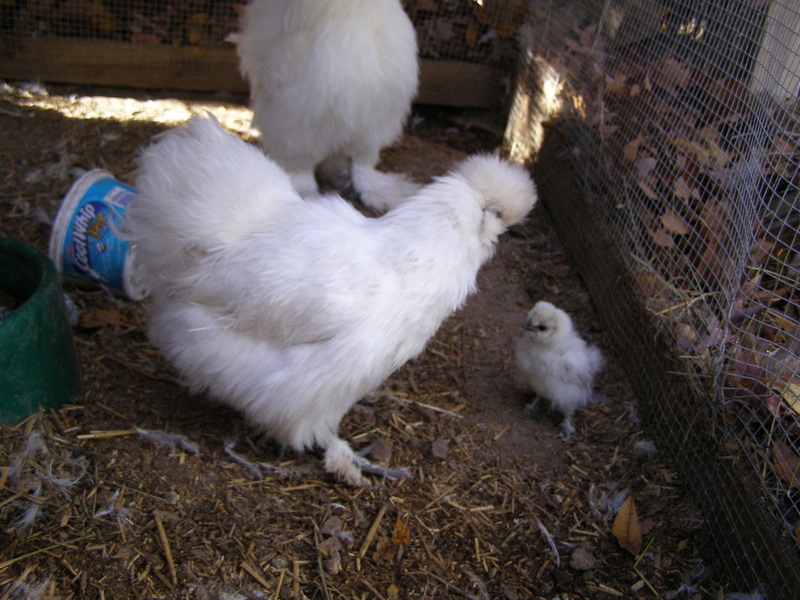 Cochin Chickens: After trying many different chicken breeds, we have finally settled upon the large cochin breed for many reasons. Naturally, we love their appearance with their abundance of feathers, but that alone would not be a reason to maintain them on the farm. Even more important than egg production, our chickens primary job is to reduce the insect/pest population that naturally occurs on any farm. We have found the cochins to be extremely effective at this task. 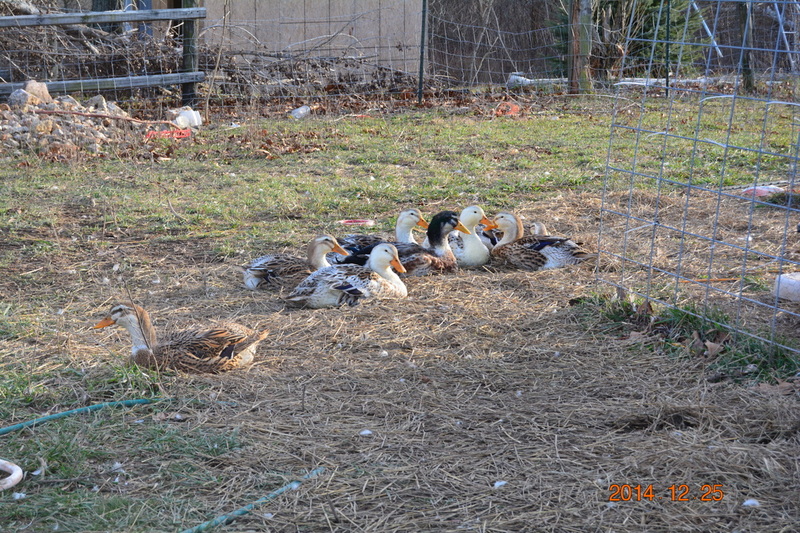 They are great foragers and love to scratch through and turn the straw bedding in the barns. Additionally, they wander the pastures reducing flea, tick, and other parasitic populations. An added bonus to us is that these are not flighty chickens and they do not like to roost up high which eliminates the risk of chicken feces upon the goats' hay or even the goats themselves (yes, previous chicken breeds had been known to roost and poop on our goats). As effective as they are in their primary job, they don't disappoint in the egg department either. Cochins produce plenty of medium-large brown-shelled eggs throughout the year. Each fall, we reduce our chicken population for winter-management and find that the cochins fill a roasting pot quite well. As free-range chickens, they do not make good fryers, but they are full of flavor and can be quite tender if cooked slowly. 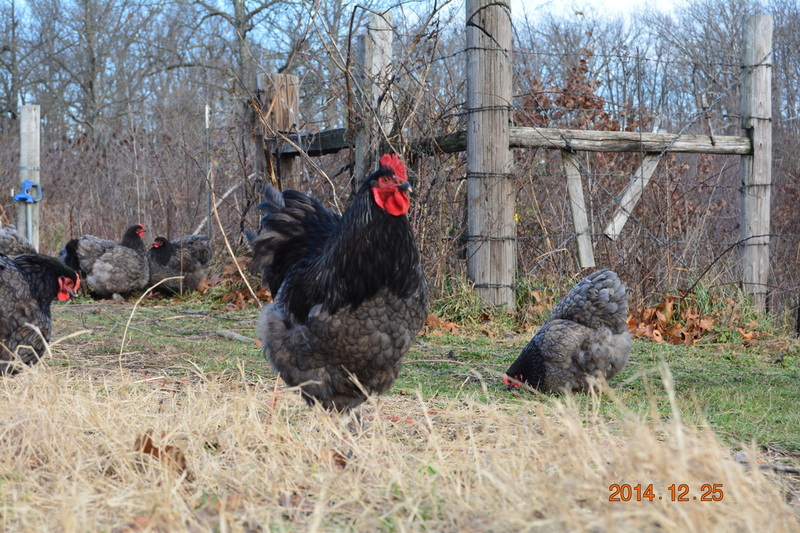 So, for us, full size cochin chickens are perfectly suited to our farm! 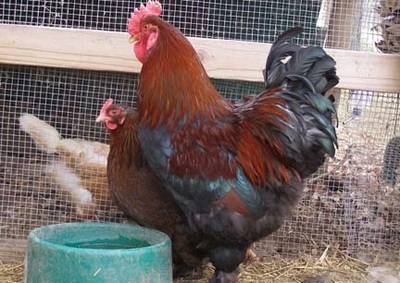 According to the American Standard Of Perfection for poultry, the cochin chicken was originally known as the Chinese Shanghai Fowl, but later become known as the "Cochin China" and eventually as simply the cochin. Even though we don't participate in poultry shows, we do strive to maintain the breed standard and cull heavily for any flaws or defects. 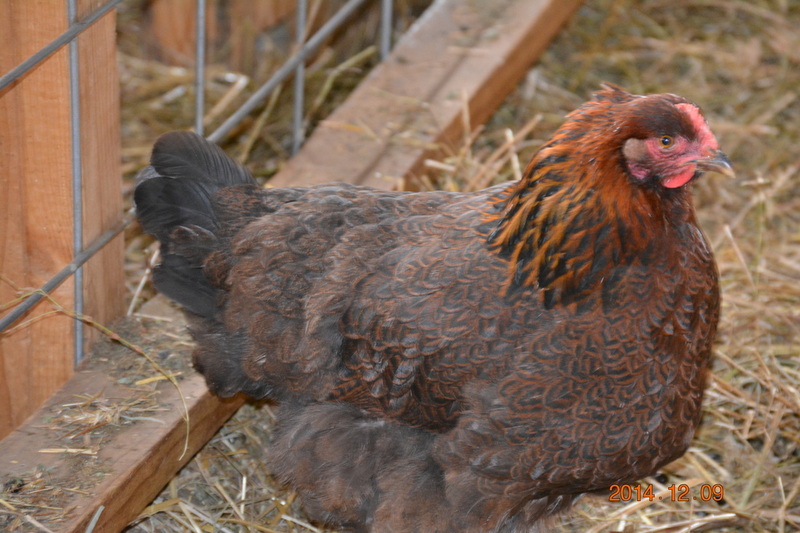 According to the Breed Standard, cochins should possess an "extra-ordinary profusion of long, soft plumage and a great abundance of down fibre in the under-fluff, producing a rather bulky appearance." Additionally, mature roosters should weigh approx. 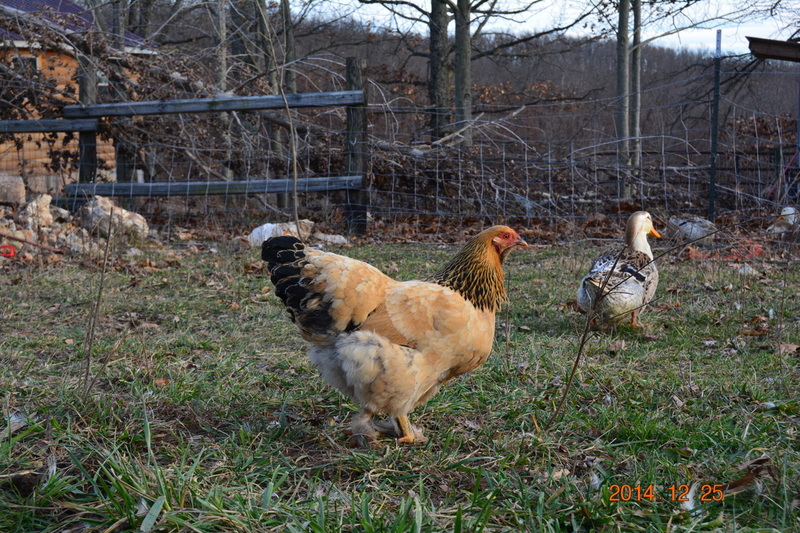 11 pounds, and mature hens should be about 9 pounds. 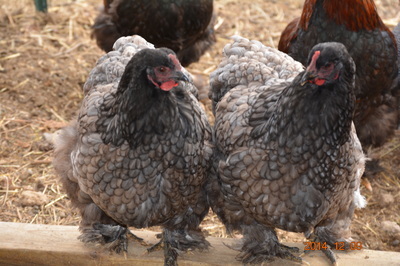 We raise primarily partridge cochins and the color variety commonly called "BBS" which includes blues, blacks, and splashes. According to the American Standard of Perfection "Blue fowl, actually of a bluish slate color, genetically are black fowl in which the black pigment granules are modified in shape and distribution on the surface of the feather, creating a dilution of black and causing the characteristic bluish slate color. This color is the hybrid expression of two hereditary color factors, black and a form of white (usually with some splashing), neither of which is dominant over the other, but which are blending in character. Blue to blue will produce offspring one-half blue, the other half evenly in black and splashed whites; and blue to black and blue to splashed will produce the parent types equally, while black to splashed will produce all blues." 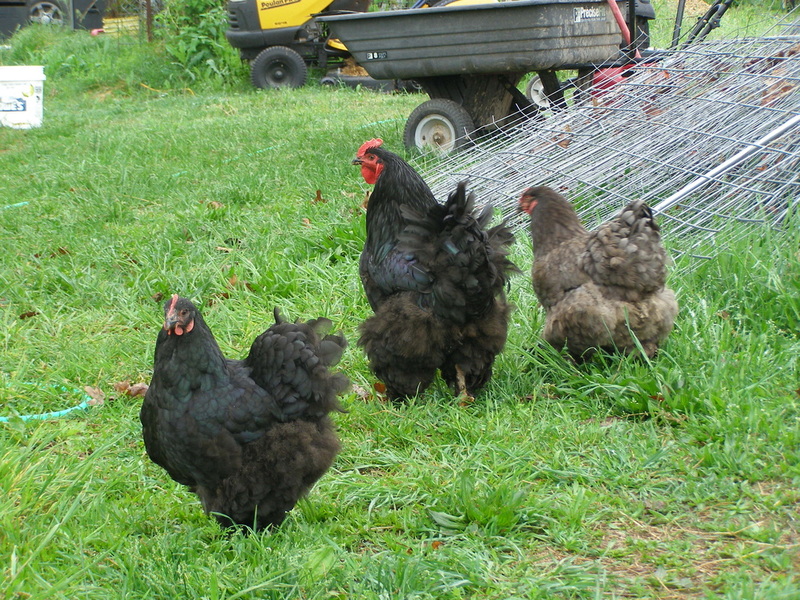 Assorted other poultry: Over the years we have raised a variety of other assorted poultry including quail, turkeys, brahma chickens, and silkies. 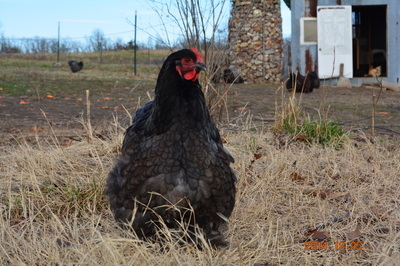 We enjoyed many of the other varieties and learned a lot from them, but not all of them were well-suited to our farm, so we no longer raise turkeys or quail, but we do still maintain a flock of buff brahma chickens and just a couple of silkies. 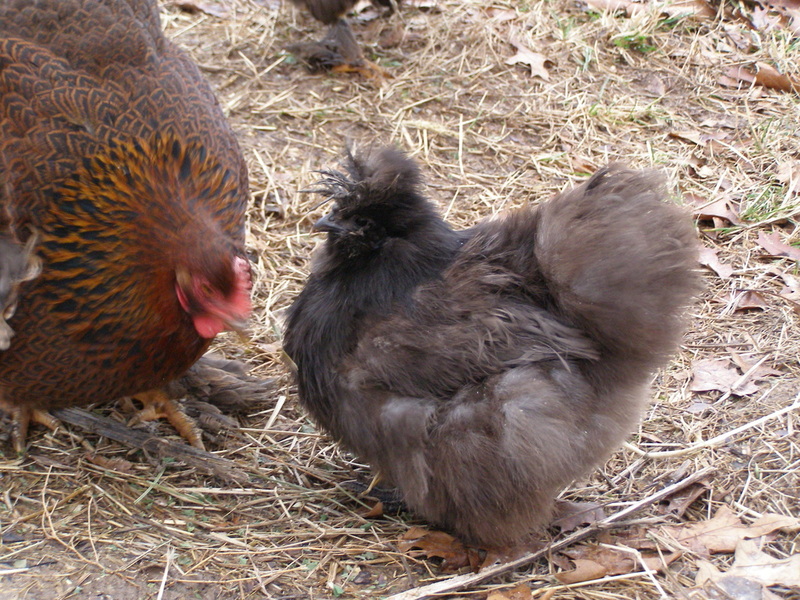 We hope to increase our silkies in the future as they are truly a joy to have on the farm, but sadly, we discovered that the silkies do not survive well in a free-range setting and we do not currently have a safe setting for a nice-sized flock of silkies. We will be increasing our buff brahma chickens this year, though, as we find them to be very similar in nature to our cochins and enjoy having them on our farm.